My wife runs a local non-profit, Foster Kinship, that helps kids and their families. Recently another non-profit purchased three $500 gift cards from a local Walmart store for a total of $1,500. They gave the gift cards to Foster Kinship to purchase gifts for 50 kids as Christmas presents. Very excited to get the gifts for the kids, my wife went to Walmart the day she received the gift cards (two days after purchase). She loaded up three shopping carts full of toys and got in line to purchase the toys with her freshly donated gift cards. But when she presented the cards to the checkout person, her joy turned to shock. The cards had already been used. All three cards were completely and perfectly emptied out without even a penny left. She’d been completely robbed! What Happened to the Walmart Gift Card Balances? Panicking, my wife asked to talk to a manager to try to figure out what was happening to her. This was a nightmare! The manager printed out a couple receipts showing basic information of the transactions on the cards. The three cards were each filled on December 7th, 2017 with $500 at store “5070 AC” which is located at 5200 S Fort Apache Rd, Las Vegas, NV 89148. Then they were all completely spent, to the penny, the next morning at store “9115 RD”, which I’m guessing is Walmart.com. My wife argued with the store manager, telling him she did not spend this money and it was fraud. The money was meant to buy Chistmas gifts for kids! Needy kids! The manager continually insisted there was nothing he could do. The store she was purchasing the toys from was not where the cards were purchased, so the manager told my wife to go to the store the cards were purchased at with the original receipt to see if the manager at that store could do anything. Really he was blowing her off. Regardless, my wife called the person at the non-profit that originally purchased the gift cards who subsequently went over to the other store and talked to the manager. The manager there said he could do nothing. He said it’s a typical scam and Walmart doesn’t care to fix it because they have fraud insurance. So my wife turned to calling the 800 number on the gift cards. One of the options is to press #2 if you want to”report your gift card lost or stolen”. When pressed, there’s a recorded voice that says, “If you are calling to report your gift card lost or stolen, please refer to “Walmart gift card terms and conditions” on Walmart.com. Doing a quick search will land you on the “Walmart Gift Card Terms and Conditions” page. There you’ll be absolutely amazed to see that they will not replace lost or stolen cards. Lost or Stolen Gift Card. Lost or stolen cards will not be replaced. Neither Wal-Mart.com USA, LLC nor Wal-Mart Stores Arkansas, LLC shall have liability to you for (i) lost or stolen Walmart Gift Cards or (ii) use of any Walmart Gift Cards by third parties through your Walmart.com account. You are solely responsible for keeping the password for your Walmart.com account safe and for any activity conducted under your account. There is nothing on the page about what to do if the card is fraudulently used, but I’m guessing Walmart categorizes that under the “stolen” category. Though the cards weren’t stolen, the information was stolen and used to make purchases. Now I’m guessing that most people that fall victim to fraud on their gift card don’t do much fighting for it because it’s probably a smaller amount. I’d guess the gift cards are usually filled with $10 – $50 dollars. So whomever is the victim of this fraud likely tries for a little while to get their money back before giving up. It’s probably not worth the hassle for many. My wife, fighting for $1,500 to be spent on 50 of her kids, was not about to give up! We contacted all the local news agencies. It was a bomb of a story! I pictured it reading, “$1,500 in Walmart gift cards, meant to buy toys for kids, fraudulently stolen from local non-profit; Walmart doesn’t care”. The headline needed to be cleaned up, but you get the idea. It had bite. Presents stolen from needy kids and a big corporate entity not caring. Two local news programs jumped on the story and interviewed my wife. Doing their diligence for the story, both news agencies contacted Walmart corporate. This is what we needed… corporate to see there might be bad press which is not good for their brand. And react Walmart corporate did. They refunded the money by giving us new un-tampered gift cards. The bottom link above has to videos. See the icons below the video player to play the original news segment. We got a bit lucky in that we are trying to do a good thing and the press was willing to help. But just know that Walmart does not have a process or solution for everyone else who’s gift cards are fraudulently used. I’m guessing that what it would cost to combat the fraud problem would cost Walmart more than is lost in fraud. And really, they don’t lose anything because they aren’t refunding the typical cases of fraud. They are just ignoring it. Now, I’m betting you are probably wondering how the fraud scam works. And here is what I’ve discovered. Below is a picture of one of the gift cards that were fraudulently used. Besides the numbers I blacked out, do you see anything funny? I hadn’t see the cards until my wife got home after the whole situation, but as soon as I looked at the strips, I knew something was funny. These cards are produced by machines by the thousands. Machines usually don’t put stickers on slightly crooked. Plus, I’ve never noticed the tape line around a scratch off before and thought to myself, I doubt these scratch off things are ever taped on; I’d think there’s a machine that directly prints the scratch-off coating on the card. It turns out I was right. Here is a picture of a legitimate gift card’s scratch off strip. There’s no tape around the scratch off area and it’s only a tiny bit crooked. Here is a picture of a card that has the original scratch off (left) and one that has been scratched and replaced with a taped-on tamper strip (right). The gift cards are just hanging on a rack in the main area of the store available for anyone to grab. The gift cards are not activated, so Walmart doesn’t care if you steal a few. They can’t be used in that condition. But the scammers are smarter than this situation. The scammer grabs a bunch of cards and either goes to the bathroom or takes them home to work on them. The scammer does some work to get the cards out of the package and write down the card number. Next the scammer puts a new, taped-on, scratch off area over the pin number. 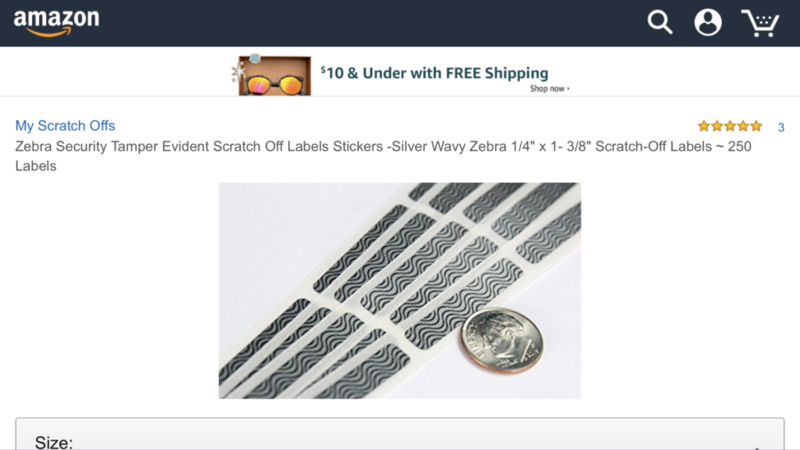 Yes, this is real, it’s easy to purchase Security Tamper Evident Scratch Off Labels Stickers for a few bucks on Amazon. To the typical purchaser, the scratch off looks perfectly fine, like it’s never been scratched off. It doesn’t even matter if it’s crooked, because the common purchaser doesn’t know what they are looking at. I even showed people the cards with the taped on scratchers, told them about the taped area, that it was crooked, and they still couldn’t readily see the issue; they really had to stare at it. Finally the scammer puts the card back in the casing and puts it back on the front of the rack. Then they go home and simply continually check the card balance either online or through the 800 number. Walmart probably sells tons of gift cards every day, especially around the Holiday season, so it probably doesn’t take long for the card to be purchased and funded. 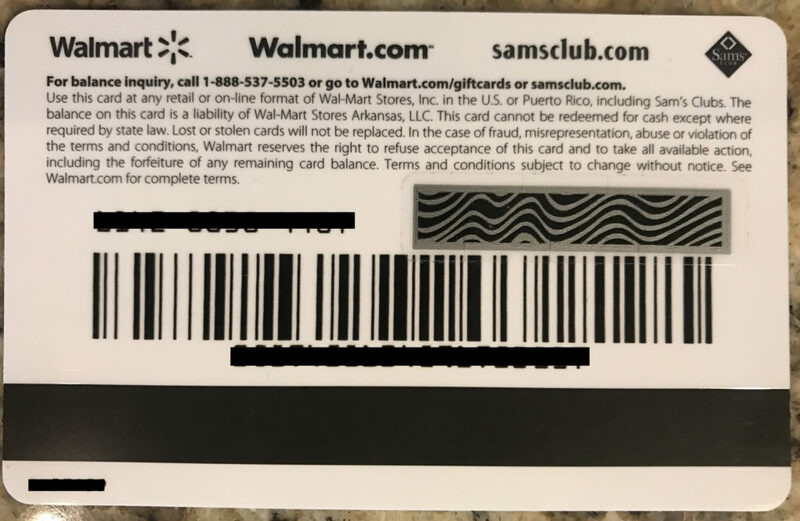 As soon as the scammer sees money on the card, they head to Walmart.com and make purchases using the card number and pin number. I’m guessing they ship the items to an unsuspecting address. Probably they find a house that someone only lives in part of the year. Or maybe an old guy that never leaves his house. The scammer can track the package and head over to the house and just grab it off the stoop once it’s delivered; likely able to set up accounts to receive texts as soon as the package is delivered. Nobody at the house complains, because they weren’t expecting the package. The scammer could probably even put a name on the package that doesn’t match the name of the people at the house (it will still get delivered) and if anyone questions them, they can just say it was their package and it was delivered to the wrong address. Or maybe they just deliver the stuff to their own homes. Since Walmart isn’t even looking into this scam and doesn’t care about it, they can probably do just that and not get caught. If Walmart really wanted to investigate, I believe they easily could. There has to be record of the ip address that was used to make the purchase with the stolen numbers. That ip could be traced (ip addresses are like house street addresses for computers). If the scammer was really careful, they may have purchased from an IP address at a place with open WiFi (ie Starbucks), but this scam is so simple and since the scammers are getting away with it, I’d bet the scammers aren’t being that careful. Or Walmart could pay attention to the stores where this is happening most and put security cameras on the gift card section and catch the person who slips the cards on and off. There’s no crime there, but Walmart could activate the cards and trace the whole interaction that takes place afterwords back to the perpetrator. That’s just a few ideas off the top of my head. I’m sure a good security expert could come up with many other ways to trace the scam to a scammer. First, realize that although these gift cards look like credit cards, they are not credit cards, and therefore they do not have the protections of a typical credit card! This fraudulent scam is obviously one where someone else was able to get a hold of the card. So now that you know about it, you can check the pin scratch off strip to see if it looks funny if buying a card that is not locked up in a case somewhere. But really, the lesson here is don’t buy gift cards off the rack. It’s probably safe to buy them online. I’d think biggest protection would be not to buy the gift cards with cash. Buy gift cards with your credit card, such that you have recourse with a company that is not the vendor of the gift card should something go wrong. 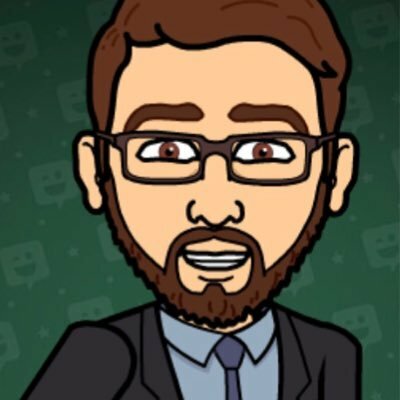 I haven’t verified it, but I’m betting you can tell your credit card company that there was fraud on something that you purchased with their card and they will give you your money back (credit card companies want you to feel safe using their cards, because they want you to use them as much as possible). This is probably where Walmart’s fraud insurance kicks in. Walmart would get what’s called a “charge back” from the credit card company which returns the money to you, the purchaser. Then Walmart’s insurance kicks in to cover the loss. Or the losses are so small relative to their gargantuan revenues that they just don’t care about the small losses. Incidentally, one story that ran just before my wife’s stories was about how an Amazon customer had their package stolen right off their front porch and amazon immediately refunded their purchase without question. So maybe try buying Amazon Gift Card online as they at least have a nicely posted policy that isn’t blatantly saying they don’t care: Amazon Gift Card Policy on Lost or Stolen Gift Cards . Personally, I predict sometime in the not-too-distant future there will be a class action law suit against Walmart (and possibly other companies; as the whole gift card thing may be handled through a 3rd party service) that are ignoring this type of fraud. People are getting screwed and Walmart is looking the other way while profiting from it.